It’s a beautiful day. You step off the trail for a snack or a pee break. When it’s time to return to the trail you can’t remember which way you came from. All the trees look the same and you don’t remember if you turned left or right when you took your break. 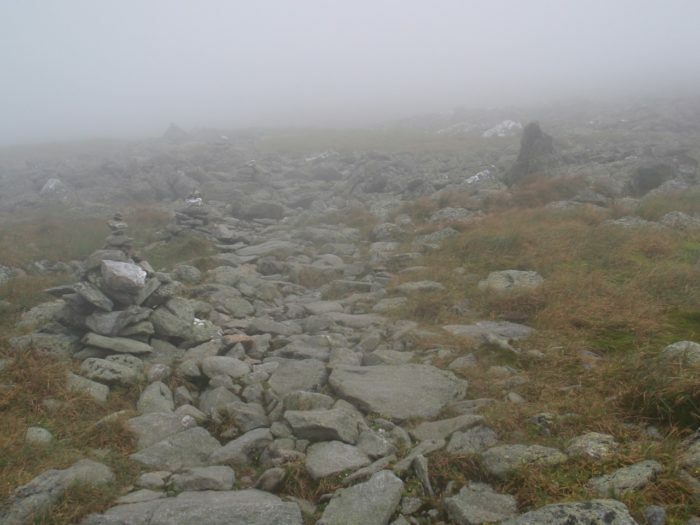 Or it’s a foggy day in the White Mountains and you’re having trouble seeing the trail markers. You keep following a path of flattish rocks but now you can’t tell if you’re still on the trail, and the fog is getting thicker. Maybe you wake up at your stealth campsite and realize you have no idea what direction the trail is. Which way did you set up your tent last night? What if you start walking away from the trail instead of towards it? Perhaps you just signed your name in a register at the top of a mountain and now you have to choose the path to go on your merry way, but there are six paths all leaving this trail register and you don’t know which one you came from much less which one you should choose now. Getting briefly lost, even on an extremely well-marked trail like the AT, is more common than you might think. Two of the scenarios above happened to me on my thru-hike, and the other two could have easily happened had I not been vigilant. If sense of direction is challenging to you, read on to find out how you can avoid getting lost in the woods. I never had a great sense of direction. My friend Suzanne used to tease me when we’d go to the mall in high school and I’d come out of a store and proceed to go back the way we’d come. My mom used to say we’d have to tie a string to the back of the car once I started driving, so I could follow it back home. I knew that I’d need to hone my skills and pay close attention if I was going to hike the AT alone and not get lost. 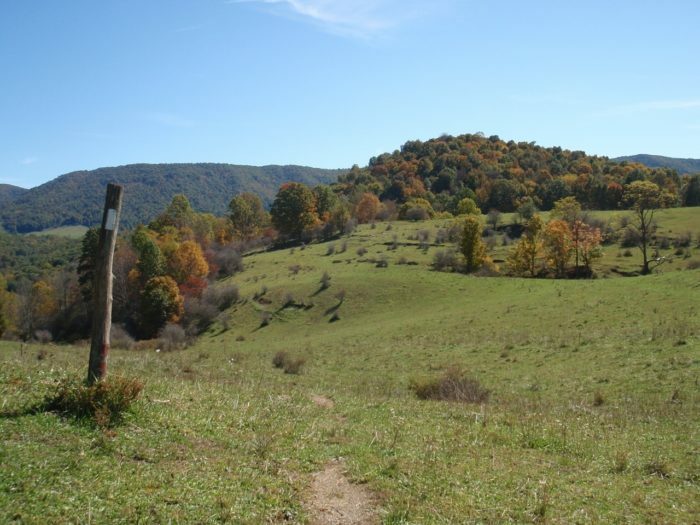 Here are ten tips for avoiding getting lost while hiking on the AT. I’m happy to report that during my thru hike, I was never lost for more than ten or fifteen minutes and I only got turned around three or four times! Over a 2000-plus mile journey, that’s not too bad! Any time you go off trail to use the bathroom, look carefully at your surroundings. Make notes of landmarks or large trees or rock formations so you can easily walk back. Turning around to see where you came from is crucial. Also, there’s no need to go far off trail if you’re just peeing. Keep that trail in sight! You can also leave your pack by the trail and make sure you can see it from your bathroom break spot. Remember all leave no trace rules when relieving yourself in the woods. When you see you’ve lost the trail, turn around. Retrace your steps to the last definite marker if possible. While you’re retracing, look carefully for other options or turns you might have missed the first time. Pay close attention in fog, as it’s easier to miss important landmarks. Sometimes you’ll need to look at clues in the trail at your feet along with landmarks up ahead. I missed a turn on a foggy afternoon in the White Mountains between Carter Hut and Imp Shelter because it was a super-hard left turn, and the trail continued ahead as well. 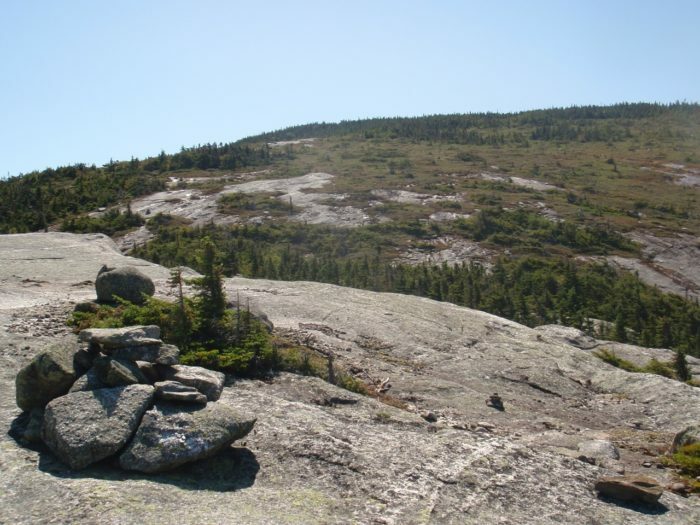 I knew I had lost my way when the trail I was on petered out into blueberry bushes, so I retraced my steps back to a big rock cairn and started again, looking really carefully. Then I saw the blaze to the left that I’d missed the first time around. Fog changes everything and makes route finding more challenging. Lookouts and overlooks can be complicated with several side trails to viewpoints. Once in New York after signing a register on a peak and taking a photo or two, I went back down the mountain the way I’d come and it took me about a half mile to realize I was no longer northbound, after a guy with a little dog mentioned some pretty falls up ahead. Wait a minute – I’d seen those pretty falls already! When you’re at a summit, both trails go back downhill and it’s easy to get turned around after you stop to take pictures in lots of directions. Make a special point to note which way you’re going to continue before you start spinning around taking selfies. 4. Hiking poles are your direction-pointing friends! Use your hiking poles when you stop for a break to help you remember which way you’re going after your break. I would place my hiking poles with the tips going in the direction I wanted to head. Or look ahead to the next interesting landmark and remember that’s the way you’re going. When you stop for the night, to get water, or take a blue blaze side trail to the shelter, make a clear note which way you’ll head out in the morning. Orient yourself and picture yourself going down the proper trail. Woods look similar. Trees look similar. You can’t count on there being signs at the shelter or water source that remind you which way is north or south. Basically I do the same thing I do when I park my car in a crowded mall parking lot – I look at what big stores are nearby then notice what entrance I go in, and if I go into a department store, what’s for sale right near the door I want to exit when I return to my car. In the woods, instead of cars and shoe displays, it’s unusual trees, rock formations, or anything else that helps. When the AT crosses a road, the trail doesn’t always begin again directly across the road. Sometimes the trail goes back in the woods 50 yards up the road so you have to look around for the next blaze. Often there’s a false trail right across the road where a lot of people have started into the woods, leaving about a thirty-foot long trail that abruptly ends as people realize they’re not on the correct path and turn and back out. I probably saw at least a dozen of these on my thru hike and I’m sure there were more I never noticed. Town can also be a tricky place to keep track of the trail as there are a lot of white markers on bridges and overpasses and telephone poles that aren’t actual AT blazes. As you hike you’ll get better and better at telling the difference. When you’re in the woods following an old road you can get in a rhythm and stop paying attention and miss the spot where the trail dips off the road and back into the woods. Keep watching for blazes any time you’re on an old road. A good rule of thumb is to avoid going more than three or four tenths of a mile without seeing a blaze – at least on the AT. If you’ve gone more than half a mile without seeing a blaze, it might be time to retrace your steps to the last known blaze. When the trail goes through a cow pasture, you might find you’re still following a path but it’s not the trail, it’s the cow path! This happened to me on a sunny fall day in Virginia somewhere – there was a blaze on a rock that me and two hikers before me completely missed. I knew something was wrong when I was ducking through brambles to stay on the path, and thankfully way down the field I saw a hiking friend in his blaze orange hat calling to me to tell me I was off the trail. Three of us ended up getting sodas and cookies from a lovely woman at a nearby farmhouse, and we took a break in her grassy yard, stopped to gather chestnuts, and rejoined the trail a little farther up the road. Sometimes getting lost leads to happy treats! Not long after I took this gorgeous photo, I was turned around and following a cow trail! Getting lost in cow pastures can lead to trail magic sodas and cookies and a great conversation with a local! You can’t follow footprints in rocky areas and if they’re above treeline, you’ll be following blazes painted directly on the rocks. Look ahead for the next blaze or rock cairn that marks the way, and in places like the Whites or the Smokies, remember that the AT isn’t the only trail, so keep checking that you are indeed on the correct trail. Carry a map that helps you see what other trails are intersecting or coinciding with the trail you mean to be hiking. When the trail is one giant rock in Maine, it’s often marked with small piles of rocks. The very first time I got “lost” on the AT I was still on it. I got freaked out by a bunch of blazes that had been painted over with black paint. It was my first week on the trail and I thought for sure I’d missed some turn and ended up on an old part of the trail that had been re-routed. I turned around and retraced my steps to a white blaze. Then as I re-walked the exact same trail again, I remembered that as a beautification effort, some trail maintenance crews had painted over white blazes where there were too many and they were interfering with the general beauty of the woods. D’oh! If the path starts to look dim, you’re likely no longer on the AT. Conversely, a pretty sure giveaway that you’re still on the right trail are tons of pole-tip holes along the edge of the trail. Other trails populated solely by day hikers are less likely to have a row of holes breaking up the moss and leaves along the trailside, making little pockmarks in the mud. The longer I was on the trail the more easily I could tell I was on the right path just by virtue of some footprints or disturbed moss. I got much better at anticipating when there would be a switchback or a turn in the trail. I could sense the route. And when I stopped for the night at a stealth camp, I could easily find my way back to the trail, turn the right way, and keep going. Follow these tips, pay attention and you too won’t have to worry about getting lost on the trail. Note: Just in case, you should always carry a compass and map and have good direction and route finding skills. You probably won’t need them on the AT but in an emergency you’ll be glad you know what to do! On the PCT and CDT, compass and route-finding skills are a must. You hit on one of my top 3 fears: getting lost, getting lost and oh, let me think, getting lost! Great tips n advice, thank you. Pointing poles in direction u want to go ?? I also wonder if just deciding that anytime u go off trail for nature calls u always go off one specific side, like right. That way u always know which direction to head whn resuming: i.e. a SOBO hiker who goes off trail to the right will resume hike to the right and hopefully will hve placed poles pointing right. Being right handed wld also be my reminder. I still see myself missing less obvious turns tho … since I’m hiking w my daughter, perhaps hiking within visual range of each, but staggered, is a strategy whn path direction is dicey. Thanks again for your advice and wish us luck! Hi Kate! So glad this was helpful. Your idea for always going off the trail in the same direction is great except sometimes the terrain dictates which way you’re going to go. You will find that you get better and better about wayfinding and knowing where you are in relation to the trail. It really is the same skill set you use to find your car in a city or parking lot, with different landmarks. When you pay attention and purposefully remember, you’re fine. I do like staying in vision range when hiking with someone else – you can also have a plan for if you miss each other. I know people who hiked together but not within vision range did things like leave their poles at the trail if they turned to go check out an overlook or take a pee break, and that can help. It’s not uncommon for folks hiking in pairs or groups to unknowingly pass each other. Making a plan for this helps – and now with so much technology it’s often easy to check in with a text. Of course sometimes there’s no service. Have a wonderful journey and trust that all will work out perfectly and you’ve prepared yourself well. Cheers! Great tips, especially the one about orienting your poles to point the way! Getting turned around trying to get back to the trail from a bathroom break or campsite is one of the things I worry about the most. I just took a class to refresh my map and compass skills, but I’d still rather not wind up lost enough to have to try to use them. Sounds like you are going to be perfectly ready, Kate! I had a compass with me, but only used it to orient my map occasionally at an overlook so I could see which mountains were which. Best wishes and happy hiking! As Always Wonderful advice!!! I love learning from you and the gracious ladies at Wild and White Blazing. Thank you so much, Stephanie! Loving following your journey this year! Great tips Carla. If you do miss a turn or get confused at a road crossing or summit (and assuming you eventually regain the Trail), a note to the maintaining club can be helpful in resolving some of the issues. We are on our sections of Trail pretty regularly, and it’s hard sometimes to imagine how a first time hiker (which pretty much all long-distance hikers are) sees thing–so knowing about trouble spots will let us help the hikers coming behind you. 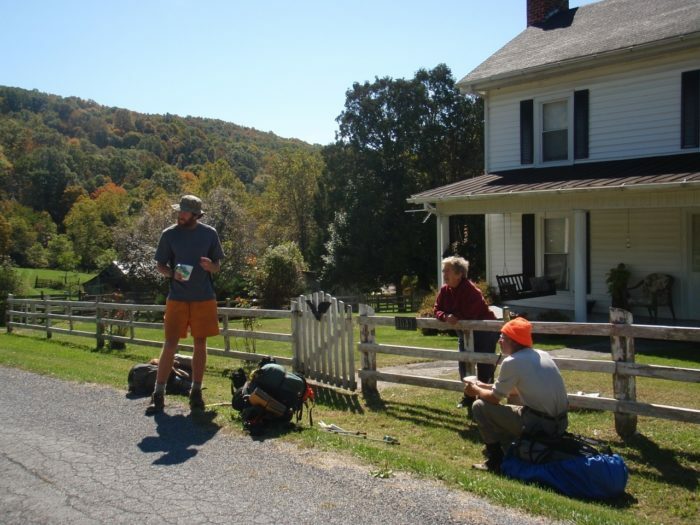 Cosmo – great reminders about how the White Blaze system works on the AT. The double blazes for turns are especially helpful and my experience on the AT was that the vast majority of it was very well-marked. The funny story about the blacked out blazes was that this was on a very very obvious side-hill trail and there was absolutely nowhere I could have missed a turn, but I was so fresh and so nervous that I didn’t simply go forward another tenth of a mile or so to see the next white blaze! Eventually that’s what I learned to do. If I was the least bit concerned I would tune in carefully and watch closely, and ask the angels to show me a blaze to confirm I was indeed on the trail. And inevitably, in about 30 seconds or a minute, I’d see a white blaze in the distance. I also learned to look behind me for blazes on the other sides of trees – a tree often has a blaze on one side and not the other. I also agree with not looking down – there’s so much to notice and looking ahead to the distance can give you a much better sense of what’s ahead and where the trail will continue. I wonder if they ever found where they thought Gerry Largay (Inchworm) went off trail (missed a turn, probably pee break, etc.). If they did, I hope it was corrected if it involved trail confusion. I wonder if she had a map and compass with her. She apparently walked a good mile or two off trail. Would having SPOT or similar device with her have helped locate her (she did climb a hill to try and get a phone signal)? I was on the AT when she went missing. A hiker I met had spent several days with her before each going a different way. When the hiker was walking back home on the trail she found one of the Missing Posters. It really freaked her out and she spent over a year before venturing out on the AT again (foul-play one probable cause). So glad she was finally found even tho it was 2 years later – so sad. Jean, I have thought about this a lot. I believe her texts said she’d gone off the trail for a pit stop and then got turned around. It’s awful how you don’t have to go very far off trail and then if you turn yourself around when you’re off the trail and you start walking towards where you think the trail is, you just get further and further away from it. And in Maine, the woods are so thick that it can get very confusing very quickly, especially if you begin to panic. Geraldine’s story breaks my heart as it does for so many of us. I suppose in her case a SPOT would have helped. There were extenuating circumstances for Geraldine as well that might have made using even a map and compass a challenge for her, and unfortunately since she was planning to meet her husband that day, I don’t think she had much food. And sadly verification by hikers who claimed to have seen her further up the trail (and were mistaken) halted searches for her closer to where she was. So many little things went awry in this case. Very very sad story. I have a terrible sense of direction and as you’ll notice from the posts, it’s not something many males seem to have (or at least are too proud to admit) so these tips are very helpful. I’m not afraid of bear encounters, rattlesnakes or mice. OK, ticks are a big fear and I’m afraid of heights so the obligatory McAfee Knob photo doesn’t make me all warm & fuzzy, but wandering off is. Some tips might be common sense (to some) but the tip about pointing your trekking poles in the direction you’re headed is brilliant. I’m so glad you found this article helpful, Pando! And you may be surprised when you get to McAfee Knob – it’s not as scary as it looks in the photos. 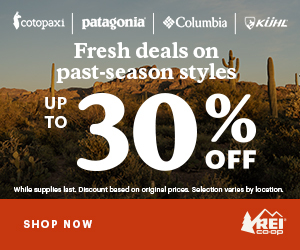 Have a great hike and treat your clothes with Permethrin to repel ticks. Enjoy, enjoy! My pleasure! Glad it was helpful – enjoy your time hiking! The details about leaving your pack within view, pointing your poles, and the earlier commentator’s suggestion to typically go to the same side (with the added bonus that if you can’t go in your normal direction, it will stand out in your memory) are all invaluable suggestions. I just read Lost Person Behavior, which details how people get lost and where they go wrong. One major thing I took away is that you should backtrack as soon as you realize you are on the wrong path, and don’t keep going forward — so you actually did the right thing by backtracking when you were anxious about the trailsigns. If there’s no trail signs anywhere around you (horrifying thought), what suggestions do you have? I can’t imagine staying put (which is recommended, but, as we know, doesn’t always work out on the AT). I realize that with a compass and watch, you could set out from some clearing/marker, treck east for a certain amount of time, backtrack to the marker if you couldn’t find the trail, then treck west. Since the trail runs N/S, you would eventually hit it, I think. I’m not sure though and I do realize this is a bit more survivalist than AT might ever require, but I’m an anxious lady. Thanks for all you are doing to support women hikers in this community!